If you own a VTEC car and are serious about getting the most out of your engine, this a must have component! THIS UNIT IS A NEW UNIT AND NEVER USED. Modifies manifold pressure signal and alters VTEC engagement point on Honda VTEC engines; Vacuum Fluorescent Display (VFD). 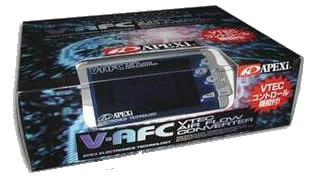 A'PEX introduces the first digital fuel computer that combines fuel computer functions with a VTEC engagement controller. The V-AFC features a user-definable, eight-point, adjustable fuel curve that can be set in 500 RPM increments. The range of fuel adjustment is +/- 50% at each of the user-defined setting points. The Fuel Adjustment function considers wide/narrow throttle and low/high camshaft settings, from which four different fuel maps are created (wide-low, wide-high, narrow-low, narrow-high). The integrated VTEC Controller adjusts the point at which the engine switches from the Lo to Hi cam during acceleration, as well as when the engine switches from the Hi to Lo cam during deceleration. Since Honda V-TEC engines are already well tuned from the factory, extracting more power requires precise fuel enrichment and V-TEC engagement control. A'PEX introduces the world's first digital fuel controller that allows precise fuel enrichment and V-TEC engagement control. Fuel control is adjusted by throttle position and there are even adjustment parameters available for both low and high camshaft lobes. This is what is required to change V-TEC engagement points without damaging your engine. A common misconception of a V-TEC controllers is that changing the RPM engagement point alone will result in increased performance. Another misconception is that increasing fuel according to RPM will result in increased performance. In reality, when you modify the V-TEC engagement point from the factory setting, the factory ECU is still on the non V-TEC fuel map. With the V-AFC, this problem is fixed by the unmatched fuel correction function. When this function is used in addition to the camshaft lobe and throttle position sensitive fuel control, the result will be a perfectly tuned engine. Due to the complexity of this product, A'PEX recommends having the V-AFC and other A'PEX electronics installed and tuned by authorized A'PEX Power Excel Shops. To see what this baby can do click here. For more information, see Apex Integration's website. Shipping & handling is a fix rate of $10 (including insurance) withinUS. only. Payment accepted in: Paypal, eBay BillPoint, Personal Check, Cashier Check or Money Order. Payment must be received within 10 days of the auction ending date. For payment through PayPal use: thezone77@hotmail.com. Payment by checks will be held until check clears before shipment. Contact me with any questions at thezone77@hotmail.com. If there are any other performance parts that you are looking for, please e-mail me and I will e-mail you with price(s). I prefer PayPal, the #1 payment service in online auctions!